Yeap. Super Green Kabobs. They get their name from the crisp fresh coriander, green chillies and green onions that blend together only to burst through the earthy flavors that are also mixed into this delicious concoction. It doesn’t taker long to make. I was actually too tired to cook something today, so I defrosted a pound of ground chicken, threw some ingredients into my mini chopper, and just threw those into the bowl once they were blended. There’s a lot of throwing into pans and bowls, but that’s about it. You can have a delicious kabob as a side to some classic daal chaawal, or you can be like me and make burgers, in less than 30 minutes. Yes, that’s my new favorite thing to do; Cook and eat in the span of 30 minutes. Keep reading if that’s something you’d like to get on board with too! Start off by washing your greens. 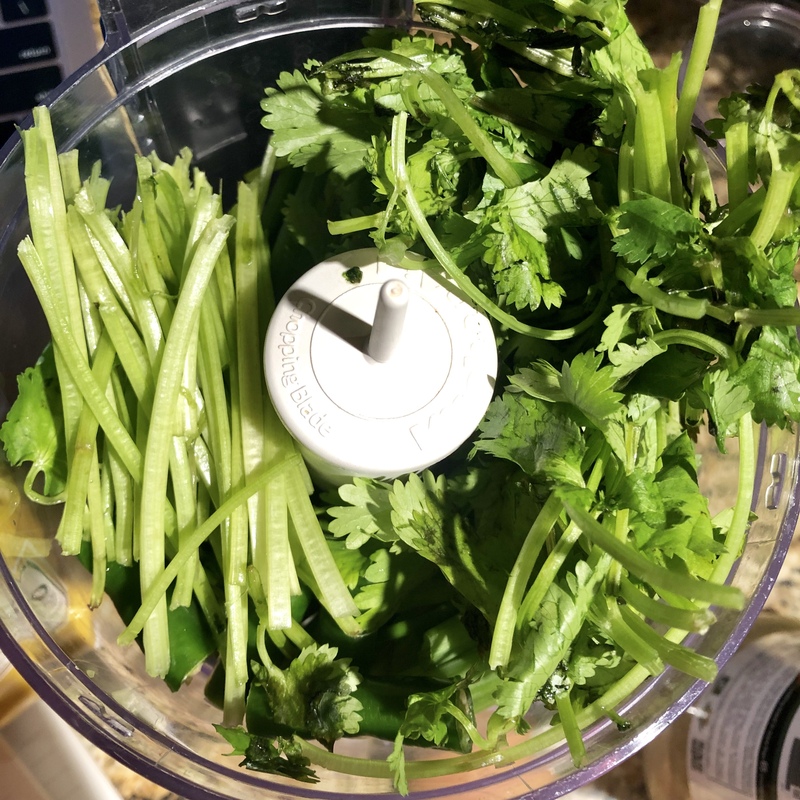 Roughly chop the green chillies, coriander leaves and stalks and the green onions. Toss them in a chopper and puree them. Then toss the puree into the ground chicken. Add all the other ingredients. Mix well and refrigerate for 10 minutes(or longer if you’re not on the 30 minute timer). The blended greens serve a greater purpose than flavor alone. They keep the kabobs moist even after they’re cooked, which also means that the mixture will be a little delicate, hence the fridge time. Heat a little oil in a shallow pan. Shape about 3 Tblspns of mixture into patties and drop them into the pan. Use water or oil to make it easier to shape the kabobs. Don’t flip them or keep moving them around because they will break. Let them cook on each side for 4-5 minutes and you’ll be fine. You can even triple the recipe, cook them and freeze them for lazy days or meal prep. I made a huge batch two months ago and they lasted me a solid month, and I’ve been trying to find the time to make them in bulk again, because they’re a life saver. They’re great with Pakistani food, and also great as burgers!